If you're creating .NET reports with significant amounts of data, it's helpful to have report design alternatives. With different layout options, you can design the report based on the end-users needs. Some users may only need high-level, relevant data, with an option to delve deeper into data at a later time. You can organize the report data in a variety of ways, placing all the data in the report upfront, or you can hide it (until the user clicks to show the details on a drill-down action). You can also add the detail data in drill-through reports. Using ActiveReports, you can implement drill-down/drill-through in different controls or data regions. However, Table, BandedList, and Tablix are more suitable to use with these features, because they represent hierarchical data. Let's create interactive drill-down and drill-through reports through a series of blogs using Tablix data region in ActiveReports. Read more about creating drill-down reports using a Table. 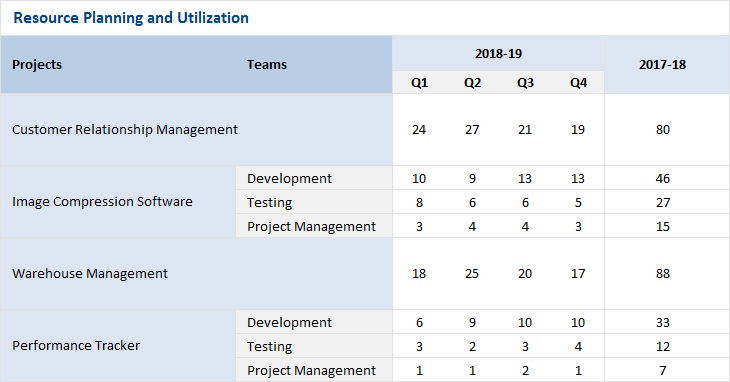 A Project Manager needs to present resource utilization/requirements data to management for next year's budget planning. This report should outline all of the projects along with their team's projects (upcoming as well as current). It would be ideal to only have one report that serves all end-users needs. A cross-tabulation layout report using Tablix in ActiveReports is the best suited, considering the nature of data. Also, considering the scope of the report, one can initially display the consolidated data and present the detailed information on the fly. 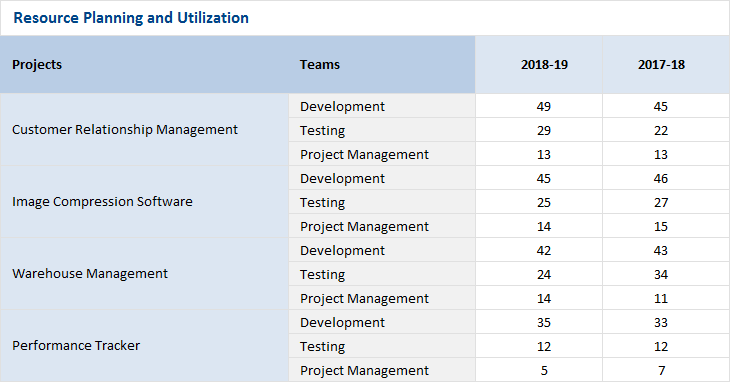 Using these features, you can create varied types of reports -- from a simple 'Resource Allocation Report' (above) to a more complex 'Olympics Medal Report' that displays the results of last five Winter Olympics (as shown below). Let's first understand the fundamentals of drill-down in Tablix before looking at how drill-down can be applied in Tablix. In another article, we give an overview on the fundamentals of Tablix. Drill-down can be applied on individual components present in the four different areas of Tablix data regions: Corner, Row Group, Column Group, and the Body. The image below gives a high-level idea of the components present in these areas. Drill-down can be added only from a TextBox control placed in the Tablix data region. Drill-down can be added to different components of Tablix, from the accessible cells only. In this case, drill-down can be added from Row group RG1 to child groups (RG2, RG3), intersecting static cells in the group and Body area (S1, S2, B1, B2, etc.). But it can not be added to adjacent row group RG4, the two column groups, other static cells (Total, B5, B6, etc.) and the cells in Corner area. Similarly, it can be added from the Column group CG1 to the intersecting static cells (B1, B3, B5 and S3). However, it can not be added to other cells in this structure. 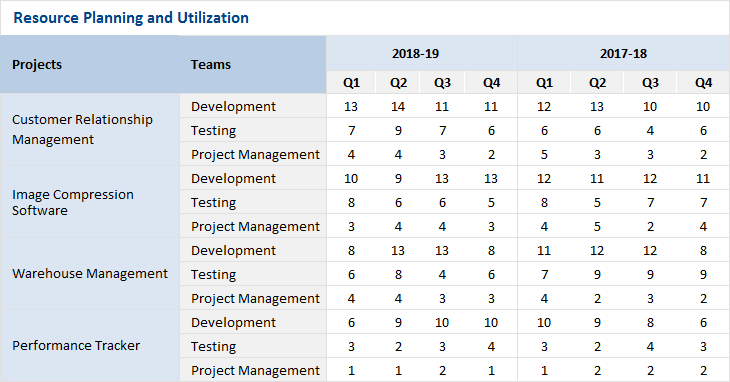 The table below enlists the source components from where drill-down can be applied and the target components that will be drilled down in Tablix. Based on the above concept, we'll look at how to create a Drill-down report using Tablix in detail through the Olympics Medal Report. In this report, there are many aspects to covered: countries, medals, sports, and events, that requires the report data to be arranged in a cross-tab layout. Tablix is best suited for this type of report. This report contains large amounts of data representing the total number of medals won by different countries in different sports/disciplines/events, and for games held in different years. Since the data is spread in multiple pages, analyzing information like total medals won by each country, ranks of different countries, etc. can become difficult. For this reason, adding drill-down for medals and events becomes necessary. This view can be initially hidden and shown when required. Let's discuss the essential steps for creation of this report. In our sample report, we will be fetching data from 'WinterOlympics_Data.json' data attached at th end of this blog. Add a Tablix data region in report, defining the required row and column groups. Specify the expressions for the groups present in the Tablix. 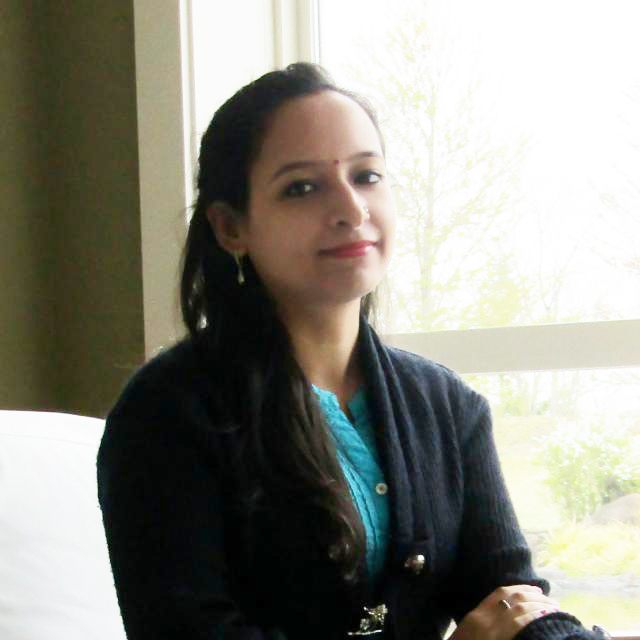 This will categorize report data into rows and columns of the data region. Next, we should configure the body area of the Tablix to display the aggregated data. 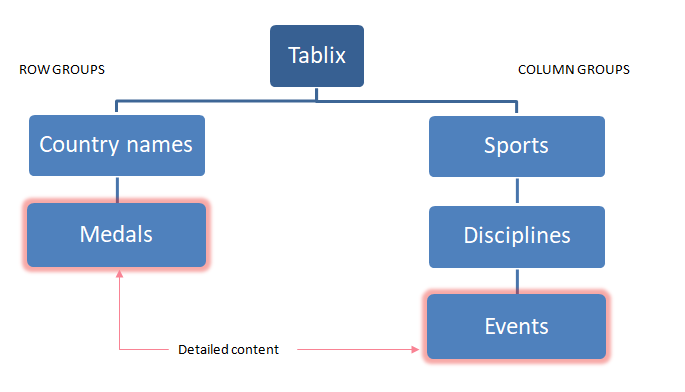 Below is the basic Tablix structure designed for Winter Olympics report following the steps 2.1 to 2.3. We have created two row groups on CountryName and Medal fields, and three column groups on Sport, Discipline and Event fields, adding in the order of hierarchy. Also expression on summation of MedalCount field has been specified in the Body area. Note: We've additionally embedded the Tablix into a List data region with Detail Grouping set on 'Year' field, just to display year-wise records on each page of the report. Before adding drill-down in the report, it is important to first identify the detailed content present in controls/data regions that could be hidden/shown on the fly, keeping in consideration the scope of report. The figure below depicts the logical representation of Winter Olympics data in Tablix, highlighting the groups with the detailed content that could be shown on a drill-down operation. Step 4: Add drill-down in Tablix. InitialToggleState property of the TextBox control in source Tablix cell to 'Collapsed' or 'Expanded'. It defaults to Collapsed, if not specified. In our next blog, we'll discuss how drill-through functionality can be added to view different visualizations of the same data using Tablix. If you have a question about Tablix please leave it in the comments below!